Happy Tuesday! Finally, I got this pattern together to add to my FREE PATTERN library! 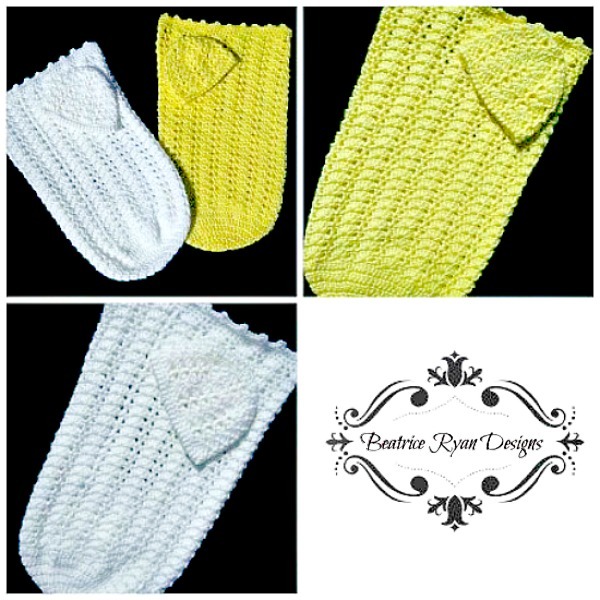 Super sweet and soft, these baby cocoons will swaddle a baby perfectly! I hope you enjoy this pattern! If you love this pattern then Please Add It To Your RAVELRY Favorites!! Click Here…. Materials: Red Heart Soft Baby Steps Yarn- 2 Skeins, 5 oz each or any soft worsted weight yarn desired. Gauge: 3”x 3” Shell Pattern Swatch = 2 Shell repeats x 5 Rows. Row 8: Chain 3 (Counts as 1st Dc now and throughout), Skip next 2 Sts, 5 Dc in next St, Skip next 2 Sts (Beginning Shell Pattern made), *Dc in next St, Skip next 2 Sts, 5 Dc in next St, Skip next 2 Sts* Shell Pattern Made, Repeat** 13 times. Join to the top of Ch 3. = 14 Shell Pattern Repeats (including Beginning Shell Pattern). Rows 9 – 31: Repeat row 8. Row 2: Ch1, Sc in 1st St,* 3 Dc in next St, Sc in next St*. Repeat ** around, Join. = 4 sc, 4 Dc Clusters. Row 3: Ch 3, Skip St, 5 Dc in next St, Skip St (Beginning Shell Pattern Made),* Dc in next St, Skip St, 5 Dc in next St, Skip St ( Shell Pattern Made)*, Repeat ** around, Join. = 4 Shell Pattern Repeats. Row 4: Ch 3, Skip 1 St,* 3 Dc in next St, 1 Dc in next St, 3 Dc in next St, Skip St ◊, Dc in next St, Skip St*. Repeat ** around 4 times ending at ◊, Join. = 4 Repeats. Row 5: Ch 3, Skip St,*5 Dc in next St, Skip St, Dc in next St, Skip St*, Repeat ** around, Join. = 8 Shell Pattern Repeats. Row 10: Ch 1, Sc in each st around, Join. Row 12: Ch 1, Reverse Sc in each St around, Join. Finish off and weave in ends. Congratulations… You now have a beautiful Sunshine and Shells Cocoon Set!! Welcome and I hope you get to make several! Hope to see you again! That will be prefect for my new great grand daughter that will be for Christmas. Great!!! Congrats on the new addition! Hi Beatrice, I have started your cacoon pattern. I have done the first row of shells. So, I am starting row 9. I am unsure as to how to start that row. Looking at your picture, it looks like all the shells are lined up in each row. So, how do I start that next row. Just as directed. You will repeat row 8,,, Starting with the Ch 3 that counts as a double crochet. You will be making a Dc in the previous rows Dc’s and the 5Dc shell will go in the 3rd St of the Previous rows shell. That way your shells line up on each other and the Dc’s line up too!! Thank you so much. I have it all figured out & it is looking great. Already thinking of the next one I want to make! You are welcome to post your finished project on my Facebook page… Everyone likes to see finished projects!! Thank you so much and Good Luck!! It is alot of fun!! My base is a little larger than 18″. Do you think that will be a problem? Are you measuring around or across?? Actually my base (bottom before shell pattern starts is 9 inches across. I was measuring wrong. What are your measurements for? The 18″ is around at the top… if you do the gauge swatch and it matches you will be good… I think the 9″ measurement will be ok… it may be slightly bigger than mine but will be fine… Babys Grow!! Thanks Beatrice, I didn’t do a gauge swatch, but I’m going to hope for the best! Beautiful pattern, Beatrice. What do the diamond symbols in the pattern mean? I’m not familiar with them. Also, if the pattern is worked in the round, where you have written “Rows” do you mean rounds or is the pattern a combination of rounds and rows? The diamond is a symbol used as a reference point… you can see the diamond in the row in the directions…. then the directions tell you to repeat from * * and end at the diamond… so you will end the row at that reference point. as far as “Rows” yes they are rows worked in the round. I always use Row terminology and dont say “Round 1” I prefer to use The Standard which is “Row 1” and indicate that it is worked in the round. Thank you for your quick response! I’m planning on making the cocoon and hat for my first grandchild, a girl. I’ve crocheted the 31 rows (repeating row 8), but the length of my cocoon only measures about 16 inches. The circumference is almost 20 inches. The pattern says the cocoon is 24 inches long by 18 inches circumference. Should I just keep crocheting rows until I reach almost 24 inches before I start the picot finishing? I really don’t want to start over. Yes, That is what I would do… I hate starting over too! I absolutely love this pattern. I love the hat. I was wondering if you had this pattern available for other sizes? Thank you for the wonderful Pattern look forward to making this. Thanks so much for the pattern. I have done a great number of cocoons as baby gifts. I always include 2 cocoons (different patterns) and 2 matching hats as well as a large blanket. The blanket colors coordinate with either cocoon so while one is in the wash they have the other one to use. Everyone loves them and raves about how comfortable they are, not only warm but helps keep the baby from kicking off the covers in the middle of the night. This is the first one I have seen with the shell stitch and cannot wait to try it. 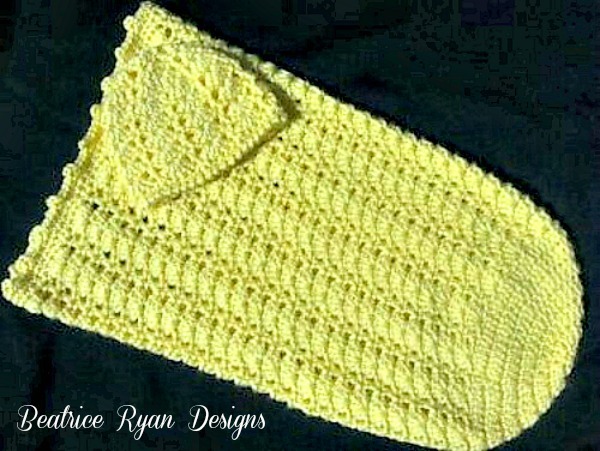 Love the way a shell stitch looks so dressy for a little girl. Thanks so much for the free pattern. Thank you for sharing your patterns which are so easy to follow as well as being beautiful. I also make tiny toys for them, and sets in case of older siblings so they have a keepsake too. I hope that your followers may be inspired to use soft leftover yarn and do this too. If you think it sad to see such tiny things, think of the gift you bring these poor parents/extended family. That is such a nice thing for you to do!! 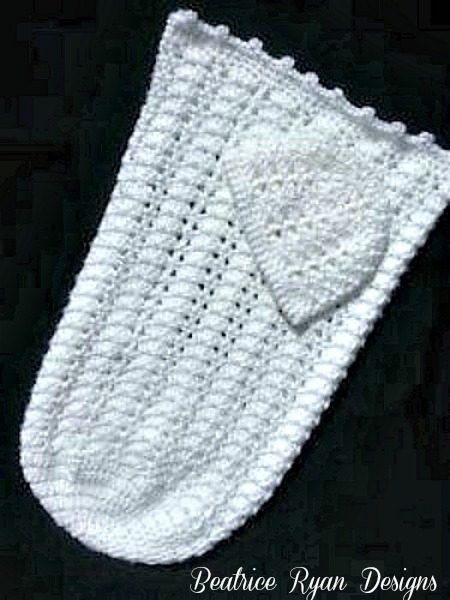 I am interested in the preemie pattern that Lucy from UK has modified. My daughter is having a baby that is not expected to live long and want to make him a snuggly for what little time we may have. I am not sure where to shore down the pattern and would love advice from one who has a working pattern. Thank you so much! Thank you very much for a cocoon with shells. It is a nice way to jazz it up. I have made 2 thus far. The second because someone saw me making the first. I have made the Very Hungry Caterpillar in the past. However, I could not quite figure out the hat. I just made my own variation of it.